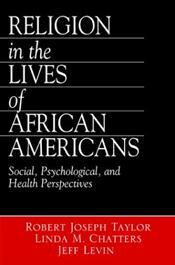 Religion in the Lives of African Americans: Social, Psychological, and Health Perspectives examines many broad issues including the structure and sociodemographic patterns of religious involvement; the relationship between religion and physical and mental health and well-being; the impact of church support and the use of ministers for personal issues; and the role of religion within specific subgroups of the African American population such as women and the elderly. Authors Robert Joseph Taylor, Linda M. Chatters, and Jeff Levin reflect upon current empirical research and derive conclusions from several wide-ranging national surveys, as well as a focus group study of religion and coping. Recommended for students taking courses in racial and ethnic studies, multicultural and minority studies, black studies, religious studies, psychology, sociology, human development and family studies, gerontology, social work, public health, and nursing.